The political state of Iran might feel like the elephant in the room in Asghar Farhadi’s masterful A Separation, but the film cloyingly acknowledges its Western spectators during the opening sequence. We watch from the point of view of a judge as a man and woman come for a divorce. Simin (Leila Hatami) wants to leave the state and because her husband Naader (Peyman Moaadi) won’t join her, she wants a divorce. She tells the judge she doesn’t want to raise her daughter in such a state. 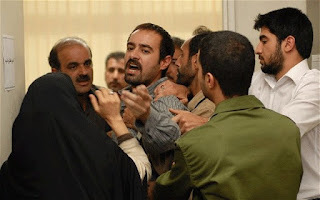 When the judge asks her to describe what is wrong with the state of Iran, she acts ambivalently toward the question. The truth, we later learn, is that she has no intention of leaving, and it is actually a much smaller, but in many ways, much greater difficulty that haunts her. That’s the crux of why Mr. Farhadi’s film is a much more human drama than anything else. 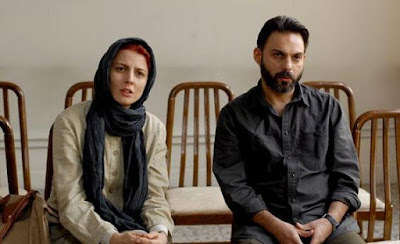 Obviously in the United States, it is difficult to watch a film like A Separation without commenting on the tyrannical power that might be lingering just below the surface. But perhaps let’s consider the narrative and style on the terms the film wants to subscribe. Few films, even those by masterful Iranian directors like Abbas Kiarostami and Jafar Panahi, give a really day-to-day life or Iran and the issues that face those who never take to the streets. What we thus find in A Separation is a wondrously observed legal drama that provides endless complexity and moral quandaries that offer no easy answers. That divorce becomes the catalyst for a number of issues that evolve from their crumbling marriage, starting with the emotional state of their young daughter Termeh, played by Mr. Farhadi’s own daughter Shahab. Termeh goes against her mother’s will and stays with her father, who has his own issues to deal with, particularly a father with severe Alzheimer’s with no time to care for him. Naader ends up hiring a woman named Razieh (Sareh Bayat) to care for the man, though she seems like a bad choice from the beginning. Razieh has a young daughter to look after, and must travel long hours to get to Naader’s home. Additionally, she worries about breaking religious code when she realizes she must clean and change Naader’s father, and cannot tell her husband about the job because it will shame him. Things come to a breaking point, a stunning reveal than tailspins the film into a series of devastating legal sequences that ask questions of guilt, knowledge, and truth. To discuss the real pathos behind Mr. Farhadi’s sublimely constructed screenplay would devolve into spoiler territory, but the film plays loose and fast with our identification of who is right, who is wrong, and what the solution could possibly be. Mr. Moaadi plays Naader with a stern and hollow face without much sign of warmth, but draws a sympathetic portrayal of a man pushed against his principles with stern power. The performance includes a lot of shouting, but Mr. Moaadi gives so much subtlety in how we should understand his character, that it is truly as remarkable as an English performance of the year (Move over Michael Fassbender!). 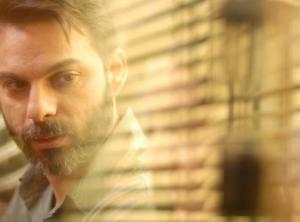 As Naader fights for his case, hoping truth will prevail, Mr. Farhadi keeps us in limbo about details. Under another director, the melodrama that drives A Separation may have come off as over-the-top and illogical, and the way it hides details until their later reveal could come off as unjustly calculated. But leave it to the naturalistic style of Mr. Farhadi to keep us highly involved in the nature. Like that opening shot suggests, we are the impartial observers of this drama, and the camera often is cluttered in the back, with objects or door frames taking over parts of the shot. In doing so, Mr. Farhadi attempts to keep us at arm’s length from the truth until we are ready. That is not to say he won’t give us a close up when needed—he knows how to compose beautiful frames by using frames and distance between his actors that speaks volumes about their relationships. And one shot in particular, a simple close-up on Termeh after she is forced to tell a lie left me in pieces. As A Separation begins to culminate, the issues on hand left me floored onto whom I should identify with in the situation, and what was the ultimately right thing. Most thankfully, A Separation never patronizes its viewers with big speeches or allegorical signs of a greater problem, keeping itself to the intimacy of its complex characters. Mr. Farhadi, best known for his previous film About Elly (a winner at the Tribeca Film Festival but never released theatrically in the states), knows that the drama is enough to debate, and his open ending might feel trite through another lens, but provides us with a final moment to contemplate what we’ve seen. Using glass often as a framing reference, this isn’t just a film about a separation by divorce, but the separations between generations, religions, and economic classes. The second time I saw A Separation, I noticed how near the end of the film, one character smashes a window, leaving a huge hole in the glass. That glass that tries to keep these characters distanced from each other, always contained in their small worlds, cannot stay bound up forever.